Home » All Countries » Israel » Drifting Apart or Working Together? Roundtable session at the 18th Herzliya Conference in partnership with the IDC. 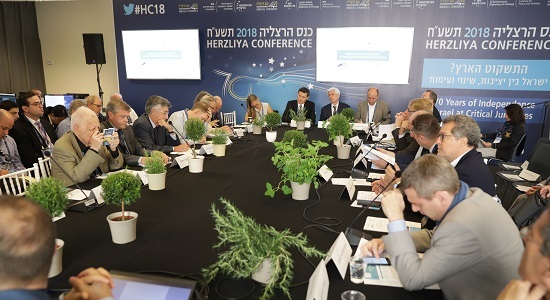 For the fifth consecutive year, ELNET and the Forum of Strategic Dialogue (FSD) hosted a special Roundtable session on May 9, 2018 at the prestigious 18th Herzliya Conference in partnership with the Interdisciplinary Center (IDC). The Herzliya Conference is Israel’s premiere annual global policy gathering, drawing together Israeli and international participants from the highest levels of government, business, and academia to address pressing national, regional and global issues. This year, internationally renowned public figures such as the US Special Presidential Envoy for the Global Coalition to Counter ISIL Hon. Brett McGurk, as well as Israel’s President Reuven Rivlin, Education Minister Naftali Bennett, Minister of Finance Moshe Kahlon, and Minister of Defense Avigdor Liberman attended the conference. For the full Conference program, please click here. The Roundtable session was entitled “Drifting apart or working together? US-Europe relations and what it means for Israel,” and included 12 carefully selected speakers, as well as approximately 60 influential decision-makers in the European-Israeli arena. Taking place just hours after US President Trump’s decision to withdraw from the nuclear deal with Iran, the discussion provided a unique opportunity for firsthand reflections on the US administration’s decision and its consequences for both Israel and for Europe.